You are currently browsing the tag archive for the ‘US War Dog Association’ tag. Tomorrow on November 11, we honor those who have served militarily in all branches of service; even those who are considered man’s best friend (and of course, a woman’s, too). 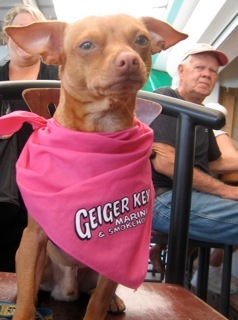 In September, the American Legion Post of Brick Township, NJ, observed its Third Annual Yappy Hour on the Creek, co-sponsored by Tito’s Vodka for Dog People. The folks at Tito’s have made it their business mission to honor our dogs, and our veterans, so this was a meaningful collaboration on all fronts. When we talk of Military Dogs, two images emerge – one of the militarily trained Dogs of War that physically serve in war-zones, and those dogs trained as Therapy and Service Dogs (There is a difference) that assist veterans when they return home; helping them with emotional and physical challenges; enabling them to be active socially and live independently. To honor all of these deserving dogs, proceeds from our Yappy Hour were received by Ron Aiello of the United States War Dog Association and Brandon MacMillan, co-founder of the Argus Service Dog Foundation. This organization trains service dogs and pairs them with war veterans in need. Brandon is also the host of “Lucky Dog” a show where shelter dogs are transformed through his training and love before being placed in their hopefully forever homes. 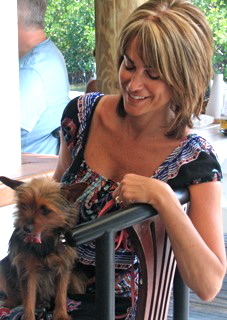 Our Yappy Hour typically coincides with National Dog Week. That’s fitting, because its founder, Captain Lewis Wm. Judy was a decorated Army veteran and served as Commander for his American Legion Post in Chicago. Long before our nation understood the value of military and service dogs, Judy was sharing his vision with a public that was increasingly “going to the dogs”. Through his magazine, Dog World, and numerous books, Judy encouraged Americans to educate themselves about the value and potential of canines. Often I see veterans proudly displaying baseball caps that proclaim their militarily service. When my husband Rich, who served as a Navy Corpsman (the medics for the Marines) wears his, I know it makes him feel good when someone thanks him for his service, so now, when I see someone proudly wearing theirs, I go out of my way to thank them. I also thank my Dad, Jack Begin, and honor the memories of his brothers, and other relatives, who served our nation. I read recently, that so few even know someone who is serving, or has served, our nation militarily. Organizations like the American Legion and Veterans of Foreign War were established and exist to help spread awareness of sacrifices made by these dedicated men and women, and allow members to continue to serve their communities through fundraising efforts. Take a moment to learn about those organizations in your own neighborhoods, and to thank a few veterans as well. Happy Birthday to the US Marine Corps!